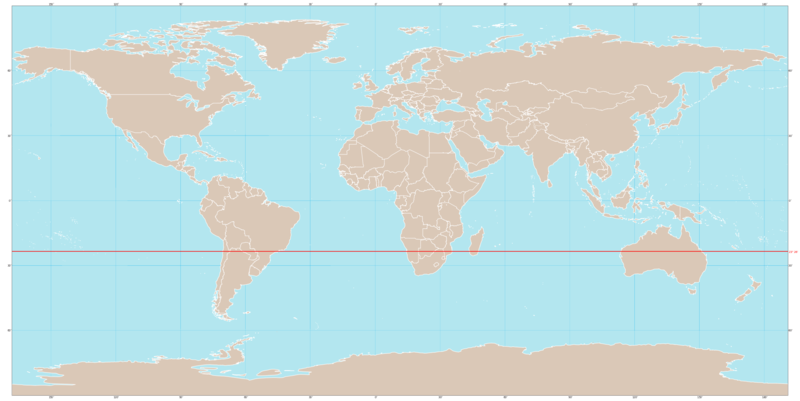 THE TROPIC of Capricorn is an imaginary line encircling the Earth at the latitude of 23 degrees 30 minutes south of the equator. It is the farthest southern latitude at which the sun can appear directly overhead. It is the southern counterpart to the TROPIC OF CANCER. Below this line is the southern temperate zone and north of the line are the tropics. The Tropic of Capricorn is so named because 2,000 years ago, when it was discovered that the sun appeared directly overhead at this latitude during the winter solstice, it was entering the zodiac constellation sign of Capricorn. The sun now appears in the constellation of Sagittarius at its southernmost point. The term Capricorn comes from the Latin words caper “goat” and cornu “horn” and is one of the 12 constellations in the zodiac. The Tropic of Capricorn is one of the five major circles of latitude that are on maps of the Earth. The circles of latitude are imaginary rings around the Earth and comprise the points that have the same value of latitude in relation to the sun. The five major circles of latitude are the ARCTIC CIRCLE (66.5 degrees N), the Tropic of Cancer (23.5 degrees N), the Equator (0 degrees N), the Tropic of Capricorn (23.5 degrees S) and the ANTARCTIC CIRCLE (66.5 degrees S). A circle of latitude is known as a parallel, because the circles of latitude are at fixed distances apart and on some maps they appear parallel. The Tropic of Capricorn is the southern boundary of the tropics. This parallel marks the farthest point south at which the sun can be seen directly overhead at noon, south of the parallel the sun appears less than 90 degrees from the northern horizon at any time during the year. The sun reaches its vertical position over the Tropic of Capricorn on about December 21–22 which is the summer solstice for the Southern Hemisphere. The tropics or Torrid Zone comprises the area situated between the Tropic of Cancer at the latitude 23.5 degrees N and the Tropic of Capricorn at 23.5 degrees S. Every point within the tropics receives the perpendicular rays of the sun at noon on at least one day of the year. The sun is directly overhead at the latitude of 23.5 degrees N on June 21–22, the summer solstice, and at a latitude of 23.5 degrees S on December 21–22, the winter solstice. The tropical zone between the Tropics of Cancer and Capricorn receives the rays of the sun more directly than areas in higher latitudes. The average annual temperature of the tropics is higher and the seasonal changes of temperature are not as diverse as in other zones. The seasons in the tropics are not indicated by temperature but by trade winds off the oceans which generate seasonal rains called monsoons over the eastern coasts. Several factors determine climatic changes within the tropical zone; distance from the ocean, prevailing wind conditions, and elevation. The tropics are home to the world’s vast regions of tropical RAINFORESTS. The AMAZON and Congo are examples of the tropical rainforest regions in the tropical zone.